Eyepiece: WF10X/20mm, High eye-point up to 21mm. SUBSTAGE CONDENSER N.A. 1.3 with Aspheric LensSystem to Provide optimum Illumination. optics and advanced features. 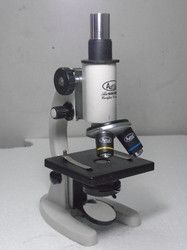 These microscope have the co axial coarse and fine focusing system, 4 objective with quadruple nosepiece, an sliding/ adjustable head and 4 spicemen slides, it's a great entry-level microscope that will last for years. 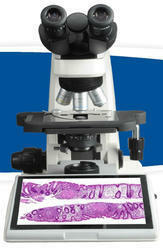 we actual producer of all types of microscopes as well as customised microscopy solutions. OBSERVATION HEAD : 45-degrees inclined Binocular head can be rotated through 360°. Interpupilary distance adjustable 50-79mm.